Dr. Sharp completed his training in Emergency Medicine at the University of Michigan in Ann Arbor, MI, where he spent the last two years of residency completing a Graduate Medical Education Scholars Program in Healthcare Administration. He also served as Chief Resident during his last year at the University of Michigan. 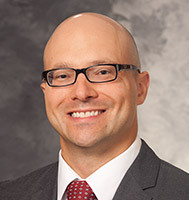 As the Director of Quality for the Department of Emergency Medicine, he oversees the department's peer review process, the Morbidity and Mortality conference series and the QI curriculum. He also serves as the Medical Director of the Emergency Department of UW Health at The American Center, which opened in August 2015. His areas of interest include quality improvement and patient safety, patient experience and medical education, with a focus on simulation.